Parent Registration is our attempt to increase communication around the school. By signing up, it means that you are interested in receiving information about events going on around school, calendar changes, school closings, fundraising activities and newsletters of information that we may post on our website or send home. Although some of these items may appear in the Wednesday envelope, this will be a way for us to communicate to you anytime. It will also ensure that we have accurate information on record for contacting you. 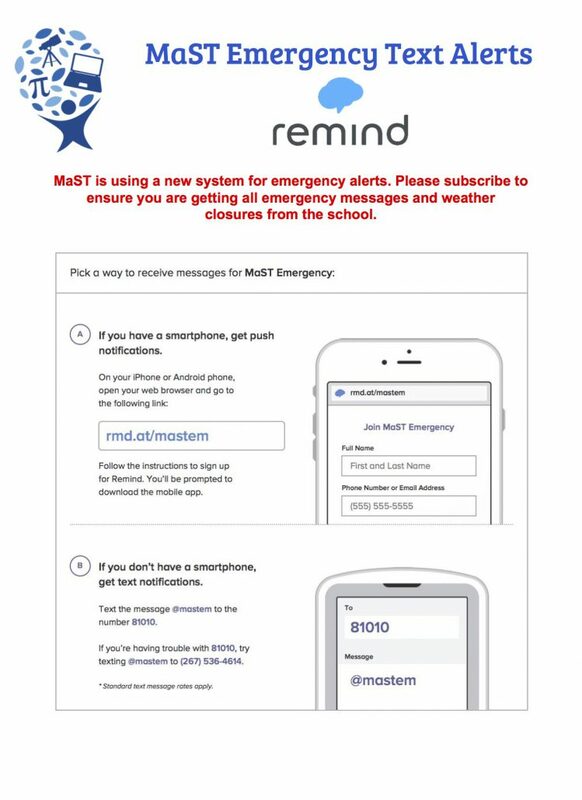 Sign up for MaST Announcements/Wednesday Envelope Here! Bus Alerts: If you would like to receive a text alert when there are delays with buses, text @mastbus to 81010.